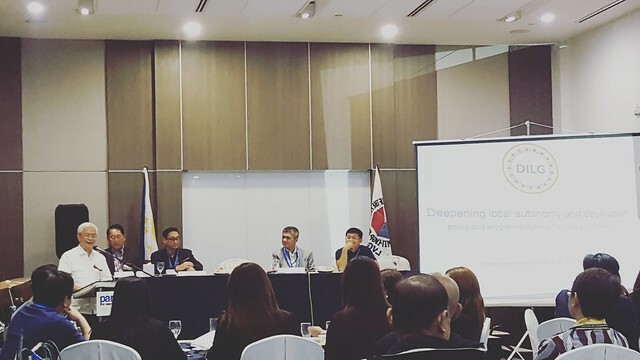 DILG UnderSecretary Austere A. Panadero spoke in front of the assembly of the League of Vice Governors of the Philippines held at the Seda Hotel in Davao City last October 17, 2016. Globe Telecom is seeking the support of the League of Vice Governors of the Philippines in building telco infrastructure in the country in line with its vision of ushering the country to become a digital nation by 2020. Specifically, Globe is looking to rationalize the permitting process to mitigate bureaucratic red tape and other political hurdles that stand in the way of deploying telecommunication infrastructure such as cell sites and fiber optic cables. If implemented, this would enable the company to improve data connectivity at lower rates. Emphasizing that data connectivity is a key driver of economic growth in the Philippines, Globe President & CEO Ernest Cu emphasized that a collaboration with the government in developing key telecommunications infrastructure would enhance digital capabilities of the country, enabling local industries and communities to access services and improve productivity. He pointed out that existing telecommunication infrastructure in a given locality, or the lack of it, is oftentimes a direct result of the LGU permitting environment. Securing different permits at LGU level could be very challenging, from the sheer number of permits to the different political personalities that mobile operators have to deal with, said Cu, adding that it takes at least 8 months to complete the permitting process, involving around 25 permits. “We would like to reiterate our call for a closer collaboration with the government as we set out in building a telco infrastructure that would provide world-class data connectivity even in areas outside our major cities,” said Cu. Globe is also maximizing the use of additional frequency assets obtained from the sellout of San Miguel’s telco assets. This is in line with its commitment to the National Telecommunications Commission to deploy about 4,500 multiband, multimode software defined radio base station equipment to 95% of total municipalities and cities in the country, for the improvement of overall customer experience in terms of the speed and reliability of mobile internet services. To date, Globe has completed the deployment of LTE 700 in 200 sites, mostly within Metro Manila, and LTE 2600 in 900 sites, mostly within Visayas and Mindanao. According to Cu, the sites where the LTE 700 and LTE 2600 have been deployed cover major business districts, and highly-urbanized and populated areas in the country. Cu further disclosed that Globe also expanded its GoWiFi network to 500 sites that include Ayala Malls, fast food chains, bus terminals, convenience stores and other public places. He added that Globe is working on widening its WiFi coverage and plans to deploy GoWiFi services in close to 1,000 sites across the country. This will provide WiFi coverage not only for Metro Manila but also for Davao, Cebu, Bulacan, Cavite, Cagayan Valley, Cagayan de Oro, Nueva Vizcaya, Dumaguete, Zamboanga, and Boracay.